Embedded Commerce is simply embedding your catalog onto remote websites that run other platforms or email or social media channels just like you would a YouTube video. 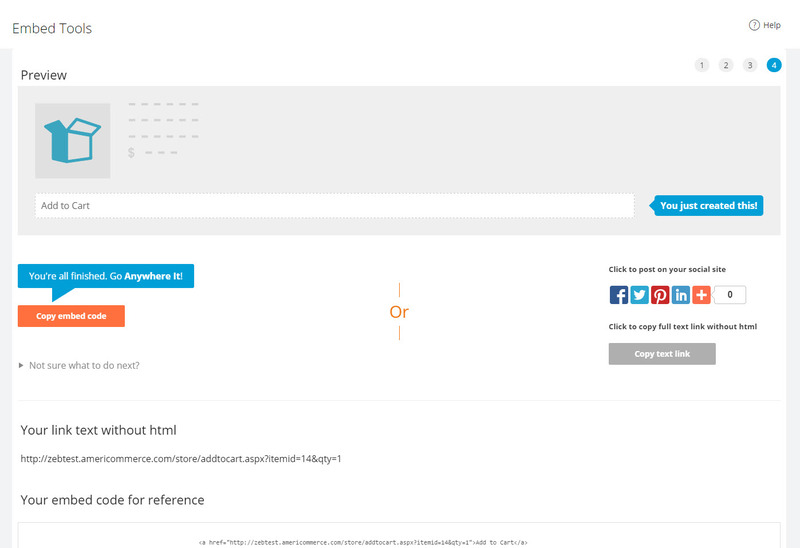 Create a product, make the link, paste the snippet anywhere you want it to show up. ANYWHERE. This maximizes your selling capabilities and channels that your catalog shows on. 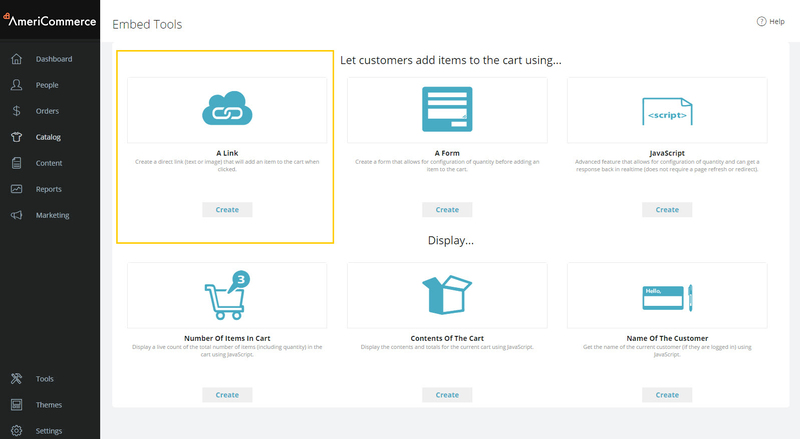 Using our Embed Tools, your customer can add products to their cart from anywhere on the web, display the cart contents on any website or interact with the catalog or customer information in easy ways. The Link option creates a basic link for a website, email or social feed like Twitter/Facebook. You would just place the link/code where you wanted it to be. See How to Sell Anywhere with Product Links for more info. Finish the step by step wizard and you will be presented with the options for posting your embed code! Use these to Add Items to our Cart! This option is great for simple product selling on facebook, twitter, etc. It works best for products without variants (although it does support them!) because each link represents one combination of variants. Not sure how to approach that last bit, if at all. Personally, I think links are best w/o variants because then each option has to be posted which is going to annoy users on facebook. This option suites mostly static sites that do not utilize dynamic pages or are limited in what type of content they can post such as on a blog. It also allows for easy customization of the product through variants on the product. The form can be displayed with drop downs, radio buttons, check boxes or any other common form element. Use these options to display information from our system! Ability to post a link or url. Ability to use html without it being removed. Understanding of html and its structure. Understanding of forms and form posts. How can I have it not display anything if the cart is empty?